CERDAAC® is an advanced software service that integrates calibration, maintenance, and service management for assets serviced by SIMCO, internal departments, or other service vendors. A secure cloud-based service, CERDAAC is a proven solution that helps thousands of organizations increase efficiency, improve compliance, and reduce costs. CERDAAC provides advanced asset and service workflow management and visibility into service status, program spending, quality compliance, key performance metrics, and more. 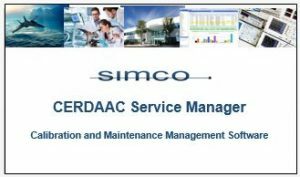 Learn more about CERDAAC Service Manager and SIMCO Manager, as well as the optional Compliance Module. CERDAAC Service Manager streamlines the management of services performed by internal teams and service vendors. CERDAAC SIMCO Manager automates the management of calibration and repair services performed by SIMCO. Compliance Module provides additional features to help Life Science organizations comply with FDA guidelines. As part of the 2018 GHP Biotechnology Awards, Global Health & Pharma (GHP) has selected SIMCO’s CERDAAC as the Best Quality Execution Software 2018.